Wedgewood Ranch: So many things to do, so little time. . . So many things to do, so little time. . .
OK, first things first. 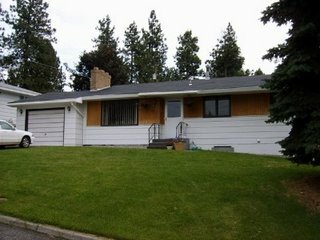 My wife and I want to paint the yellow portion (see picture in previous post below) of the exterior and the front door before it gets too cold. We like the rest of the exterior color scheme as it is now (white body and black trim), so it would be nice to find colors that coordinate nicely with those. Of course, being the indecisive couple that we are, we're having a hard time deciding on what colors to use. My wife thinks we should paint over the yellow with a dark shade of gray, and then paint the door a deep red. I, on the other hand, have no clue. I do think that the colors she's picked would look good with the white and black, but it may be kind of boring, too. I'm not stuck in the mindset that it has to be "historically accurate" to the time period in which the house was built (1958), but it might be kind of interesting to go by those guidelines. Any ideas would be greatly appreciated! *For reference, the original color of the yellow area was a hideous caramely brown (as seen in the above picture). . .really ugly! The door was originally unpainted wood, but it's a little late to go back to that.